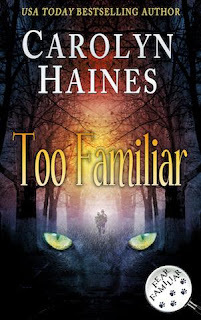 I've been collecting cat mysteries for about 15 years now, and when I started one of the very first series I was introduced to was the Familiar, Black Cat Detective series of romantic mysteries written by Carolyn Haines. Seventeen books were released by Harlequin Intrigue starting in 1990, and I have every one in it's original paperback format. 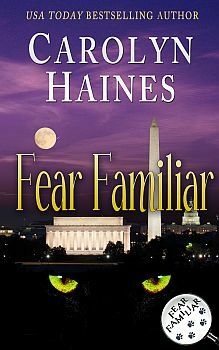 I was so excited to learn that 6 of the original titles are being re-released in ebook (the first, Fear Familiar, is available on Kindle today for only 99 cents! ), and this summer will see the debut of a brand new line of romantic mysteries starring Familiar's son Trouble, who is following in his dad's paw prints as a black cat detective! Here's the one and only Familiar to tell you all about it! Because I’m black, sleek, and incredibly brilliant, I have quite the fan following. In fact, I’ve been hired to solve mysteries all around the world. Some people see me simply as an elegant black cat—but others are aware that I am Familiar, the black cat detective. The humanoid I control (and tolerate) is one Carolyn Haines, a good-hearted soul if somewhat on the bumbling side. But she has faithfully penned all 17 of my fine feline adventures as I traveled the world to solve crimes and help wayward bipeds find true love. My relationship with Carolyn goes way back to the 1990s, when I solved my first case. Carolyn (writing then as Caroline Burnes) faithfully took down the story and published it in a book called FEAR FAMILIAR. Now she has made that book new again, re-issuing it on April 10 for a very special discounted price of .99 cents here at Amazon. While bipeds are normally a bit on the lazy side, I have lit a fire under Carolyn, and she will also re-issue TOO FAMILIAR (May) and THRICE FAMILIAR (June) before we launch the very first book about my son, Trouble, who is following in my pawprints. FAMILIAR TROUBLE will launch in July and mark the beginning of a number of new stories written by a host of talented mystery authors. I would love to rest on my laurels—just curl in the window seat and watch the Washington D.C. summer come on strong--but there’s still much to be done. Humans, if left to their own devices, are notoriously slothful. So I’ll keep the pressure on at my end—but I need readers to also apply some pressure too. If you demand more adventure stories about me and my son, then the writers will be forced to comply. Bipeds are not all that complicated. They can be easily manipulated—so help me out. Back in the day, when I was a frisky young tom, I never envisioned that I would be the king of my own publishing empire. If I had thumbs, I could take over the world. I can see it so clearly: a legion of cat lovers would follow my wise and benevolent lead. Peace would reign across the planet, and everyone would have enough fresh fish and seafood to eat. Sometimes, after a lovely dinner of grilled salmon, I curl up beside my human and dream of a world where cats rule. Close your eyes and follow along. First off, cars and guns would be abolished. Humans need more exercise and walking is the perfect method of attaining that goal. Now that the Internet is invented, there’s no need to hurtle their bodies through time and space. Removing cars, planes, and trains would be a huge step toward reducing pollution and noise—not to mention the dangers of running over my friends. No more trees chopped or roads paved to facilitate more cars! I agree that spay and neuter is desperately needed in places where my fellow felines have overpopulated. But first spay and neuter the dogs (Have you ever watched what dogs eat? A true digestive horror!). Then include neutering for all species so that the poor planet won’t get overburdened with too many of any one organism. Cats have long known the benefits of laying in the sun to recharge our batteries. I would insist on solar and wind energy production. I’m not a fan of catfights (though I have seen some highly amusing hair pullings in the human species) but I do believe arguments should be settled with fists or claws, not knives or guns. Weapons banished! Statues to cats would be erected in every community. Veterinarians would be honored, too. Ah, dreaming is such hard work. I think it might be time for a nap. Then another adventure. A cat’s work is never done! To keep up on all the latest news in the Familiar Legacy series, follow Familiar and Trouble on their website and Facebook! Hello there, Familiar! I love learning of new books to read, and these sound especially fun and fantastic. More books for my to-read list, just how I like it! What fun! I have never heard of this series before. I'm excited to check them out! Thanks, Melissa. I had never heard of this series, either. I'll do my best to entertain you--and the menagerie. I'm mostly smarter than humanoids, but I keep hoping to find the one that proves me wrong. Familiar is an older series, but starting in July, we will have brand new adventures starring Trouble, son of Familiar! I hope you give the books a try. I'm so happy to bring these books back to life. I've never heard of this series, but it sounds like a fun one!